We have seen many reports on smartphone market share in the future. Even IDC, Gartner reports that Windows Phone will be the No.2 smartphone platform by 2015. But in short term, Digitimes Research study expects a sales of 40 million Windows Phone units in 2012 occupying 6.2% of the whole market. The market will be lead by Android with 386 million units and iPhone with 121 million units. Microsoft and its OEM partners should more than double their market share every year to make the IDC report true. Lets see how it goes ! ! 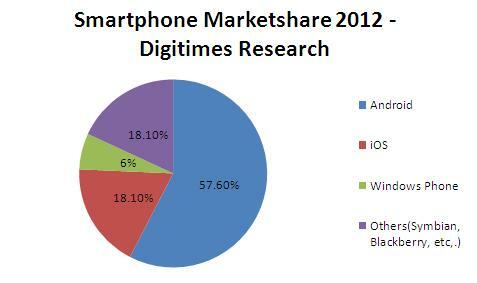 Source and Chart based on Digitimes Research.